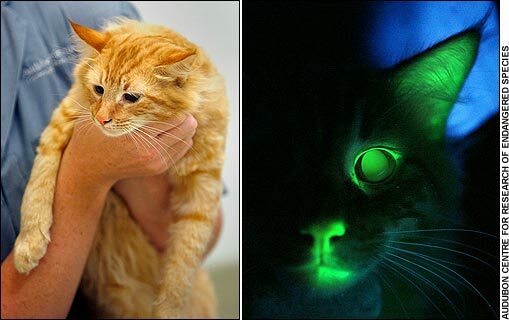 By day he is just a normal tabby but when the lights go out this ginger cat glows in the dark. I bought a new laptop today. My desktop is 7 years old and my other laptop is 6 years old so I decided a deserved a new computer. I've spent the day uninstalling all the crap that comes preloaded on the unit and downloading and installing the stuff I really want to use. This is the new computer's inaugural post. A US judge has thrown out a case against God, ruling that because the defendant has no address, legal papers cannot be served. I think these fall under the category of "Now I've seen everything!" WASILLA, Alaska (AP) _ The camera closes in on Sarah Palin speaking to young missionaries, vowing from the pulpit to do her part to implement God's will from the governor's office. What she didn't tell worshippers gathered at the Wasilla Assembly of God church in her hometown was that her appearance that day came courtesy of Alaskan taxpayers, who picked up the $639.50 tab for her airplane tickets and per diem fees. An Associated Press review of the Republican vice presidential candidate's record as mayor and governor reveals her use of elected office to promote religious causes, sometimes at taxpayer expense and in ways that blur the line between church and state. ANCHORAGE, Alaska (AP) -- Sarah Palin unlawfully abused her power as governor by trying to have her former brother-in-law fired as a state trooper, the chief investigator of an Alaska legislative panel concluded Friday. The politically charged inquiry imperiled her reputation as a reformer on John McCain's Republican ticket. Investigator Stephen Branchflower, in a report to a bipartisan panel that looked into the matter, found Palin in violation of a state ethics law that prohibits public officials from using their office for personal gain. John McCain: If your campaign does not stop equating Sen. Barack Obama with terrorism, questioning his patriotism and portraying Mr. Obama as "not one of us," I accuse you of deliberately feeding the most unhinged elements of our society the red meat of hate, and therefore of potentially instigating violence. At a Sarah Palin rally, someone called out, "Kill him!" At one of your rallies, someone called out, "Terrorist!" Neither was answered or denounced by you or your running mate, as the crowd laughed and cheered. At your campaign event Wednesday in Bethlehem, Pa., the crowd was seething with hatred for the Democratic nominee - an attitude encouraged in speeches there by you, your running mate, your wife and the local Republican chairman. TROY, N.Y. (AP) — Who is running for president? In an upstate New York county, hundreds of voters have been sent absentee ballots in which they could vote for "Barack Osama." WASHINGTON (AP) - Less than a week after the federal government had to bail out American International Group Inc. (AIG), the company sent executives on a $440,000 retreat to a posh California resort, lawmakers investigating the company's meltdown said Tuesday. Election officials and watchdog groups are bracing for the wave of sneaky or suspicious phone calls, leaflets and emails that typically hit battleground states in the final 30 days of the presidential campaign. Young voters at Drexel University in Philadelphia, Penn. have already been targeted, with students reporting that flyers have been posted around campus warning that undercover police will be at the polls on Election Day looking to make arrests. The flyer reads like a friendly letter to fellow students relaying a warning from an "Obama supporter": "He informed me that on the day of the election there will be undercover officers to execute warrants on those who come to vote based on the anticipated turnout," writes the anonymous student in the letter which was later posted on the Drexel College Democrats website. "He advised me if I had any outstanding warrants or traffic offenses I should clear them up prior to voting." The Nation | Who You Callin’ a Maverick? “I’m just enraged that McCain calls himself a maverick,” said Terrellita Maverick, 82, a San Antonio native who proudly carries the name of a family that has been known for its progressive politics since the 1600s, when an early ancestor in Boston got into trouble with the law over his agitation for the rights of indentured servants. This is the story of the real John McCain, the one who has been hiding in plain sight. It is the story of a man who has consistently put his own advancement above all else, a man willing to say and do anything to achieve his ultimate ambition: to become commander in chief, ascending to the one position that would finally enable him to outrank his four-star father and grandfather.